I’ve received some great gifts in my life, but looking back on them, few surpass the gift of knowledge. And most of the knowledge I’ve acquired has come from books. Some of these books inspired me to dream; to imagine no longer living poor. Some helped me build a business; to avoid the mistakes of other entrepreneurs. Some gave me confidence; to believe in myself and what I’ve learned. But the greatest book I’ve ever received (after the Bible, which you already know about) is a book called the The Shaolin Workout: 28 Days to Transforming Your Body and Soul the Warrior’s Way. The older you are, the more this book is for you. And if you don’t care about self-defense or martial arts, this book is for you. It has fundamentally improved my health, my posture, my attitude. As I walked my dog recently, living in the moment and enjoying heaven on earth, I realized I must share this book with everyone I can. To not do so would be a sin. It would be nothing short of theft. And as I felt inspired to share this amazing gift, I wondered: How do you describe such a book? How do you describe a book that years ago (when I first bought it) made me feel completely at peace when just minutes before I’d been worrying about my lack of health insurance and the struggling company that I had founded, which could barely pay me $20,000 a year and still had nearly $100,000 in debt? How can a book with just a few stretches, exercises, and teachings bring true happiness? How can such a book almost instantly lift your mood and make you ecstatic to be alive? How can it do this when minutes before you were seconds away from giving up, crying, or wanting to end your life? How can it take you from no hope to hope in just minutes? And what would such a book be worth? My first thought as I walked my dog recently in complete bliss — living fully in the moment, as the book teaches — was that such a book would be worth at least $500. I’ve spent $500 to travel far away and gaze at the ocean while waves lapped my feet and gulls glided by me. I’ve experienced that heaven on earth and it was worth every penny of that $500. But, I had never experienced this heaven on earth while sitting alone in a barely-decorated, empty, bland room, surrounded by stress, to-do projects, and intense feelings of deep depression. So, what’s a book worth that gives you that feeling of deep peace and happiness any time you want, without having to travel or spend additional money? I can say with complete certainty that this book has given me this feeling hundreds of times, and I literally carry it in my work bag every single day — I hate not having it by my side. What’s a book worth that does this? I think without question that this book is worth $10,000. It’s changed my life that much. It’s made me happier, healthier, improved my posture, and allowed me to catch glimpses of God’s beauty that I’d never seen before (by teaching me to live in the moment, not in past regrets or future fears). It’s helped me deal with angry customers and bad employees and “impossible” situations — all with a smile on my face and laughter in my heart. Furthermore, the book has the best abs/core exercises I’ve ever seen, and believe me — between four years in the Marine Corps and nearly thirty years as a fitness fanatic — I’ve seen them all. Yet still, this Shaolin workout does so much for your posture and attitude with these unique exercises that you’ll feel a difference very quickly as you explore it. I’ve shared parts of this book with family and friends and they’ve all been changed. The book is that deep, and that powerful. But remember, we shouldn’t be surprised. 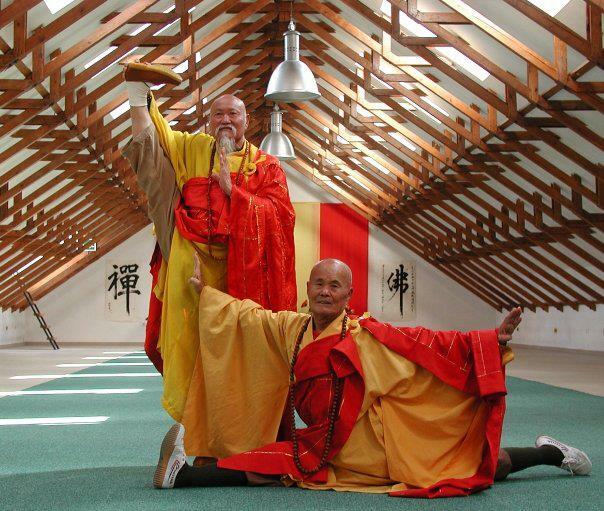 The book contains 1,500 years of compiled wisdom from Shaolin Monks. These teachers have seen what bad posture does to you. How sadness and negativity can beat you down and wreck your body. They’ve seen how birds live their lives, gleeful and spry (ever seen a sad bird?) and they’ve transferred this knowledge into passed-down wisdom. The only folks who won’t like this book are young. If you’re under twenty, don’t waste your money. You haven’t experienced the hell of life. You’re still rushing through it 90 mph convinced happiness awaits you at the next mile marker. You’ll soon learn you’re wrong, just as I did, but you’re too young to listen to me, just as I once was, as well. But for everyone else, this book is over-the-top good. It will change your life, if you let it. If you simply just try its stretches and exercises, and read its teachings on philosophy/Eastern thinking at the end of each chapter, you will begin to be fundamentally changed. You will sharpen your life and launch yourself into those projects you’ve been putting off, and you’ll do so with a smile and a light heart. So, there you go. I’ve tried to explain the inexplicable. I’ve attempted to give you the greatest gift I’ve ever received. This book has taught me to slow down, live in the moment, and feel handsome and pure; like an angel on earth that God wants to wrap His arms around, instead of some worthless failure who’s wrecked by the reality that I didn’t measure up, who’s frustrated that my body is growing weaker and softer each passing day, and that feels with a growing dread that I’m growing older and older, and that the best may be behind me. It’s taught me to love harder and give more at work and in everything else I do. It’s taught me that life is a blessing, and that I can grow younger every day — not older (you’ll understand this admittedly crazy point once you read the book). You can mock this post. You can ignore it. Frankly, I don’t blame you. And, I might have, too, if the situation were reversed. But I have attempted to hand you the greatest gift I could give you. The book isn’t free though… It’s roughly $20, depending on when you check its price. It’s the cost of a night out for dinner or some silly purchase you won’t remember a month later. And it’s right there. A single link, awaiting you, battling your skeptical mind with nothing but the power of centuries worth of love and wisdom that you won’t find in Western teachings. If you’re not convinced, I hope you’ll at least go read the reviews on Amazon and give it some consideration. And for those who take the plunge based on my words, I hope this book transforms and improves your life 1/1,000th as much as it has mine. And when it does, you, too, will be begging your friends to buy it, like some babbling idiot. Like it’s something you must share. Trust me on this. Here’s the link again to both the paper and Kindle versions on Amazon. P.S. For those who may wonder, the author’s teachings do NOT interfere with Christianity. He expresses his appreciation for Christianity and all religions and even says not to change your faith. ← 4 hostages rescued in Afghanistan, but is the situation worse?